People with congenital insensitivity to pain (CIP) cannot sense painful stimuli, and as a result continually suffer painless yet detrimental tissue damage, sometimes resulting in death. Mutations in a handful of genes have been recognized to cause the rare condition, but a new report identifies a novel gene culprit: the epigenetic regulator PRDM12, which has a hand in development of pain-sensing neurons. The study appeared May 25 in Nature Genetics. The work began as two parallel studies led by Geoffrey Woods, University of Cambridge, UK, and Jan Senderek, Ludwig Maximilian University, Munich, Germany, who later combined their efforts. Woods began by studying a Pakistani family with CIP who did not bear any of the mutations previously found to cause CIP or hereditary sensory and autonomic neuropathy (HSAN, types IV and V), a related condition with similar symptoms. The team scanned the patients’ genomes using a single-nucleotide polymorphism (SNP)-based array to look for autozygous genes—those that appear in duplicate handed down from a common ancestor. The screen yielded an 11.5-Mb homozygous region containing 150 genes on chromosome 9. The researchers, including co-first author Ya-Chun Chen at the University of Cambridge, next sequenced genes contained within the giant region in one patient. No obvious pain-related genes popped out, but sequencing of the same region in another, unrelated patient from an Italian family bore fruit: a homozygous missense mutation in the PRDM12 gene. The team then returned to the Pakistani family to scrutinize PRDM12, which had not previously been associated with pain. “We found their mutation was a polyalanine tract expansion. Normally, the tract consists of 12 repeats, but in this family it had increased to 17,” Woods told PRF. Although polyglutamine repeat expansions are more commonly known to produce pathological conditions, polyalanine repeats are also found in a number of neurological diseases (Albrecht and Mundlos, 2005). “Prdm12 normally goes to the nucleus, but the mutation made the protein aggregate and get stuck in the cytoplasm” of HEK-293 [human embryonic kidney 293] cells, Woods said. Co-first author and clinician Michaela Auer-Grumbach, Medical University Vienna, Austria, identified additional patients for the study. Sequencing of PRDM12 in two patients from two additional unrelated families revealed mutations in both subjects. Following this lead, the team next sequenced PRDM12 in 158 additional patients with unexplained CIP or HSAN and found homozygous mutations in seven people, including several with the polyalanine expansion. Like other patients with CIP or HSAN, affected members of the 11 families examined in the study carrying PRDM12 mutations experienced no acute or inflammatory pain, could not detect noxious heat or cold, and had sustained injuries to the mouth, fingers, and toes. Other senses, including detection of light touch and vibration, were normal, as were autonomic functions, for the most part. Heterozygous family members were unaffected. How did the PRDM12 mutations cause the loss of nociceptors in the patients? The team hypothesized that loss of Prdm12 protein disrupted development of pain-sensing neurons during embryogenesis. To test that idea, the group used the recently pioneered technique of differentiating human inducible pluripotent stem cells (iPSCs) into nociceptor-like neurons (see PRF related news story). The engineered cells’ production of Prdm12 skyrocketed about day 9 in culture, the time when the cells adopt their sensory neuron-like phenotype. Likewise, the gene’s expression peaked in mouse embryos about the time when neural progenitor cells become nociceptors. 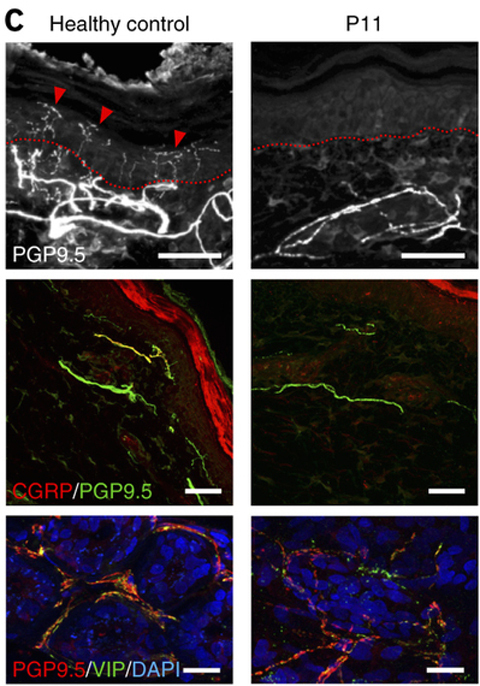 PRDM12 was also expressed in adult human tissues—exclusively in dorsal root ganglia (DRG). “PRDM12 is expressed during a very narrow window in development, and then it comes back up postnatally,” Woods said. “We assume that it has a postnatal role in pain, suggesting that modulating it may be a new route for pain control.” Woods also said that expression of Prdm12 in nociceptors is “exquisitely selective” to those cells, so any potential therapeutic agent engaging the protein would likely not have off-target effects on other cell types. Patients with classic CIP carry loss-of-function mutations in SCN9A, the gene encoding the voltage-gated sodium channel Nav1.7, thought to render pain-sensing neurons silent but structurally normal (Cox et al., 2006; although a recent paper co-authored by Woods identified novel SCN9A mutations in CIP patients with Nav1.7 channels that retain some function, see Emery et al., 2015). In contrast, the current findings indicate that nociceptor differentiation is abnormal in patients with the PRDM12 mutation. People with HSAN IV and V carry mutations in genes for the TrkA receptor or its ligand, nerve growth factor (NGF), respectively. “Without the NGF signal in early development, the neurons cannot survive,” Costigan said. While the current work also describes neurons’ failure to develop, “this looks a bit different—a completely new, interesting mechanism,” involving epigenetic control, he said. Prdm12 belongs to a family of epigenetic regulatory proteins that interact with histones, the proteins around which DNA wraps (for a review of pain epigenetics, see PRF related news story). Prdm12 lacks enzymatic activity of its own; instead, it recruits the G9a methyltransferase, which attaches two methyl groups at lysine 9 on histone 3 (H3K9me2). Whereas overexpression of wild-type Prdm12 in Xenopus embryos increased H3K9me2, expression of Prdm12 with missense mutations seen in the CIP patients did not. Presumably, the polyalanine expansion mutation would prevent Prdm12 from fulfilling its epigenetic role. The results suggest that PRDM12 mutations handicap histone methylation, leading to changes in gene transcription that prevent differentiation of nociceptive neurons. Costigan agreed that the presence of Prdm12 in adult human DRG suggests it might present a new target for analgesic drugs, but future work will be needed to determine whether Prdm12 activity continues to influence nociceptive function in adulthood. While HSAN IV and V result from a developmental failure due to loss of NGF or TrkA, “blocking function of those molecules in normal animals and people has an action on pain, so there is precedence for this idea,” Costigan said. Image credit: Chen et al. Transcriptional regulator PRDM12 is essential for human pain perception. Chen Y-C, Auer-Grumbach M, Matsukawa S, Zitzelsberger M, Themistocleous AC, Strom TM, Samara C, Moore AW, Cho L T-Y, Young GT, Weiss C, Schabhüttl M, Stucka R, Schmid AB, Parman Y, Graul-Neumann L, Heinritz W, Passarge E, Watson RM, Hertz J M, et al. Nat Genet. 2015 Jul; 47(7):803-8. Epub 2015 May 25. In addition to this report, an elegant study co-led by Greg Neely and Josef Penninger has been published (Nagy et al., 2015) that demonstrates PRDM12 is essential for neuronal specification in Xenopus and nociceptive function in Drosophila. Just like in humans, if this gene is damaged, the flies are unable to feel pain—demonstrating the exquisite conservation of gene function through half a billion years of evolution, a concept that we had previously reported (Neely et al., 2010). This study went one step further, however, and overexpressed the human mutated PRDM12 gene in Drosophila, which produced the same lack of pain phenotype. These studies, therefore, show the exact same mutations cause a similar condition in flies as in humans—an astounding level of functional conservation (Nitta et al., 2015). Nagy et al. (Nagy et al., 2015) also identified a core group of genes regulated by PRDM12 in Drosophila—these genes are likely to be of great importance in sensory development, and, indeed, experiments in this paper and previous studies demonstrate this.